GC Star Powder in Marilyn: I was a little skeptical about this highlighter when I first received it because it was quite shimmery to my taste, but when you use it sparingly it gives a beautiful dewy finish. Recommend using Real Technique Small Fan Brush 🙂 You can read my complete review on Marilyn and its sister shade Lucy here. 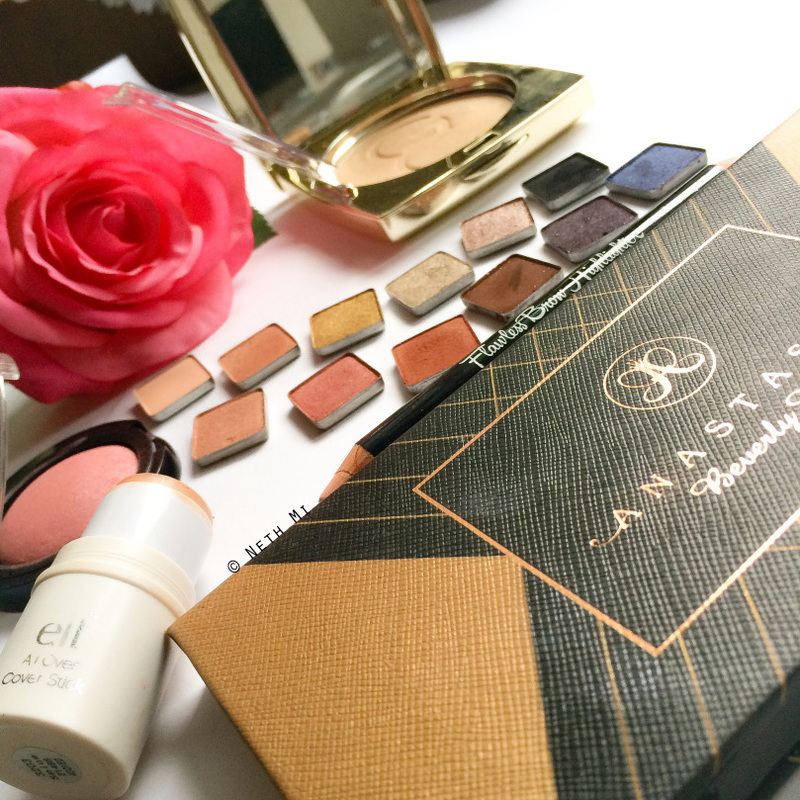 ABH Shadow Couture World Traveller Palette: Perhaps the most wanted palette this August worldwide, I was super lucky to get my hands on this one last month from beautybay.com I love this palette so much that I used at least one shade of it every single day since I received it. I’m planning to use it this month too. It’s the perfect transition palette from summer to autumn so I guess it’s so appropriate to use it during this time of the year. It has neutrals mixed with pops of colour, and that matte black “Noir”! Now I know why Tamanna (from DressYourFace) always uses this colour! It’s the blackest of blacks you can ever find with incredibly less fallouts! My go-to combo last month was Bellini on the lid, Morocco on the crease with Noir used as a liner 🙂 Want to know more about this palette? Check out my complete review here. BH Cosmetics Flawless Brow Highlighter: Was not exactly a necessity, but I enjoyed using it to give a nice lift to my brow bone. Will write more on this later 😉 Until then, you can check the product and reviews from other beauties over here. ELF Cosmetics All Over Cover Stick in Spices: I bought this one from my beauty BFF Nisha for as low as LKR 350.00!!! I’ve seen many Instagram accounts that sell ELF cosmetics for high prices like LKR 6000.00, claiming that they sell only originals and etc… All I have to say is an ELF product can NEVER go above LKR 2500.00 (keeping a margin for shipping, etc) even if it was an eyeshadow palette and if you’ve already bought from them, you’ve been totally ripped off! Anyway, that was some extra news for you, so moving back to the actual ELF product I’ve been loving in August… It’s a really smooth concealer that gives medium to full coverage and is extremely easy to blend. This wins over the NYX cream concealers, and can even be a good dupe for MAC’s Concealer Stick too! Isn’t that great news? BH Cosmetics Bombshell Blush in Delightful: OMG! This blush is one the best drugstore blushes ever! It’s so smooth and silky, blends easily and has good pigmentation. I have a pending review on this one, so more later! So those were the top 5 favourites from last month… I still use all of these everyday and let me know if any of these products made it to your August favourites too!